The final artwork is still in progress so have a gig flyer instead! I never ask to get sneaky peaks of recordings Ferocious Dog are working on – when people ask I truthfully say there’s an appeal to waiting for the big reveal when the CD arrives in the post. Funnily enough the latest person to ask was Ken – Ella and I had popped to see him a few weeks ago for some tattoos – he was surprised, and once he’d navigated the labyrinthine band and crew WhatsApp group admittedly we did hear a few songs through a tinny phone speaker whilst he kept tabs on Mansfield Town surprisingly failing to beat local rivals Notts County. Fast-forward a couple of weeks and a Facebook message pops up from Dan with a link to a Google Drive with ten mp3 files. The only accompanying explanation was ‘nearly mixed’ – no matter how much part of me might want to wait for the big reveal, it’s not like anyone is going to resist that opportunity, now is it? So of course I fired up the laptop and got downloading, eager as a kid on Christmas Eve to get stuck in. Whilst I’ve worked out how to do this here blogging lark I’ve got another album I’ve been hammering lately to muse upon. It’s one I’ve been waiting to hear for what feels like ages. I’ve made no secret of my love of McDermott’s 2 Hours in the past – so relatively new release Besieged was a very exciting prospect and it’s not disappointed. A collaboration with the aforementioned along with Levellers and Oysterband, it’s a long overdue sequel to excellent similar co-creations – the last one I think was Disorder way back in 2004… gosh, that makes me feel old! This could well be the full-stop for McDermott’s 2 Hours. And sure enough, it’s a fitting epitaph (of sorts – I don’t think Nick is hanging up his metaphorical creative boots for other projects). It kicks off with the barnstorming Firebird, fiddle-driven and bouncing from the off with Nick Burbridge‘s inimitable vocal delivery setting down a strong marker. I absolutely adore both Nick’s lyrical skill (and Jeremy’s in the case of this song) and his delivery. This is a great example of both working in wonderful harmony with the expert instrumentation from the band – drenched in themes of some kind of renewal, characterised of course by a firebird, which is a phoenix, innit? Ooh, hello – amazingly I actually remembered the login details for the blog! The new album from Headsticks landed on my doormat this week, and whilst I’ve deliberately reined back on writing it has inspired me to try to remember how all this internet stuff works. Because it’s just shy of an hours worth of excellence. What struck me above anything is there’s some real diversity in stylings and tone from what I expected, and a progression from their previous two excellent albums (I wrote about Feather and Flame just here). 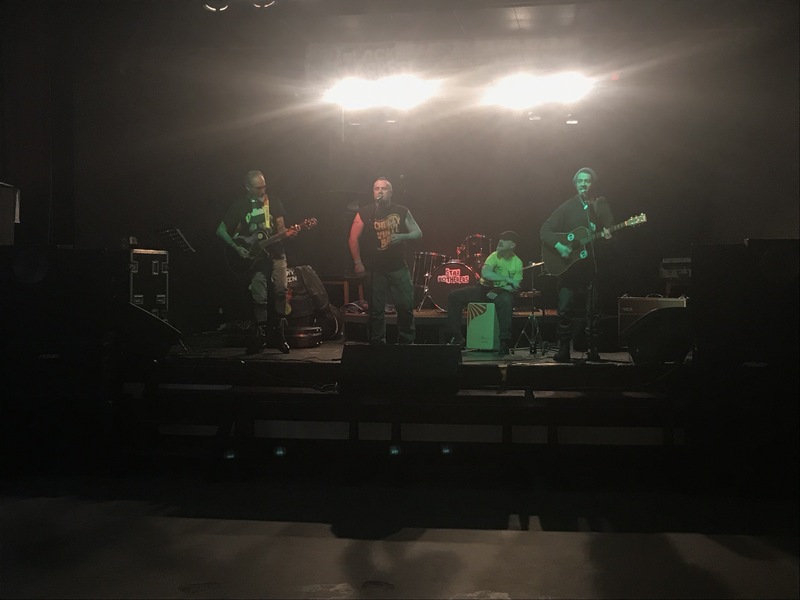 The Stoke on Trent band present here a collection of songs that showcases a band really comfortable in their own skin – and perhaps most stark that I’ve not really associated with them before is a sense of playfulness and fun. Which probably isn’t surprising for anyone who’s spent any time with Andrew (and I dare say the rest of the band, who I don’t know so well! ), but where before social-consciousness and politics have been central pillars, in here we have that enhanced with a proper cheekiness – not least with Mushrooms which, whilst underpinned with a serious message delivered over a bouncy skank overlaid with sinister pixie laughs. It sounds silly written like that, it’s so catchy though! Master of plenty! 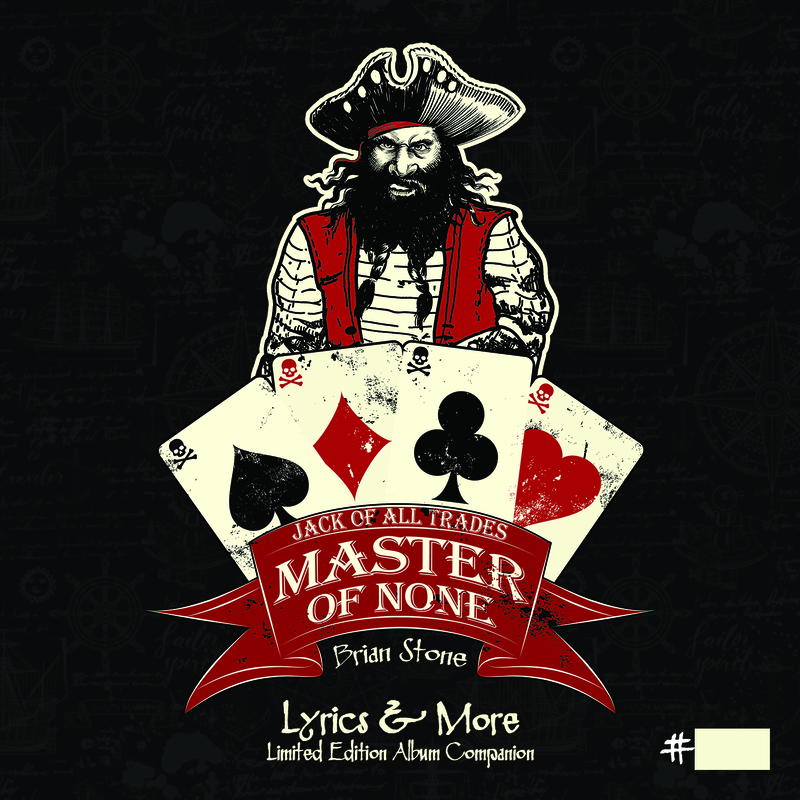 Brian Stone album is OUT NOW! Brian Stone releasing his debut album is definitely a good reason to dust the cobwebs off the blog again – I was really chuffed when he got in touch to ask if I was still reviewing stuff. Admittedly I’m doing so much less fervently these days – so getting a download link and getting everything synced across to my phone felt quite exciting – I could get a few listens in before getting to grips with writing up a review. Also that residual nervousness, it’s a mate’s blood sweat and tears you’re being expected to somehow do justice to in words. Well, I’ll give it a go! I was reflecting when I first got to know Brian, I think it was at a Gaz Brookfield gig in Oakham, Rutland when we first got talking a good few years ago now – about three and half years ago he and Karen kindly provided me a bed for the night after Ferocious Dog played Cambridge. After that gig he casually picked up his guitar apologetically before playing through some FD, Gaz Brookfield and Leatherat songs – always one to play down his talents – which quickly became a fixture around campfires and then of course stages over quite a short timespan really if you think about it! What I particularly love about this album is the assemblage of lots of friends to add their instrumentation to the songs – it’s a risky prospect, we’re used to Brian in solo acoustic guise – but this is done really well, some songs have a full band sound, which don’t detract from the underlying tune, some remain stripped back – it’s all done very well (I was terrified to see Maty Tustian listed on backing vocals, for example!). The combination of Brian’s songwriting, the artists’ interpretations of that and the predictably awesome production Joel Howe lends to proceedings gives a polished but authentic collection of songs. Wow, I remembered the login details to this page! 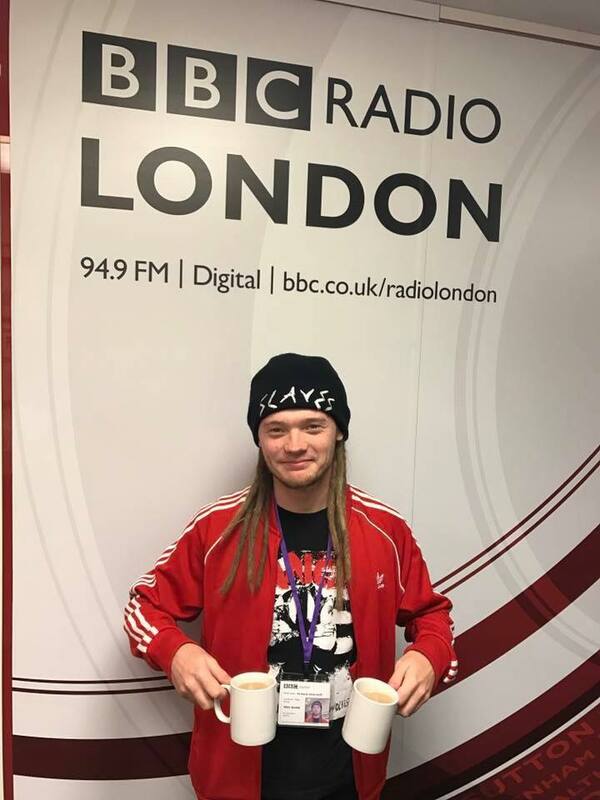 If you didn’t hear the four piece incarnation on Jo Good’s Radio London show earlier, then thankfully Matt was on hand to save a recording as the popularity of the band seems to have broken iPlayer! Featured is a first live airing (and first acoustic attempt) of one of the songs from their soon-to-be-released album, it’s called The Landscape Artist and was co-written by non other than Jeremy Cunningham from the mighty Levellers. You can have a listen below – it sounds great, lyrically evocative and a great melody – it’s really whetted the appetite to hear the full band version! Enjoy, and thanks to Matt for grabbing it as by the time I tried to do it iPlayer was broken! Well done chaps, bodes well for the new album which obviously we’re all ludicrously excited about anyway! I’ve been looking forward to Funke and the Two Tone Baby’s new album – Denizen – ever since he’s talked about creating it. There’s a few familar songs there from the last year or so of gigs which have evolved over time, and some new ones – and unusually we had the opportunity to hear them all live before getting home to eagerly listen to the recorded version. Playing the last date of his tour at Bodega in Nottingham last Sunday we all crammed in to see what the fuss was about. 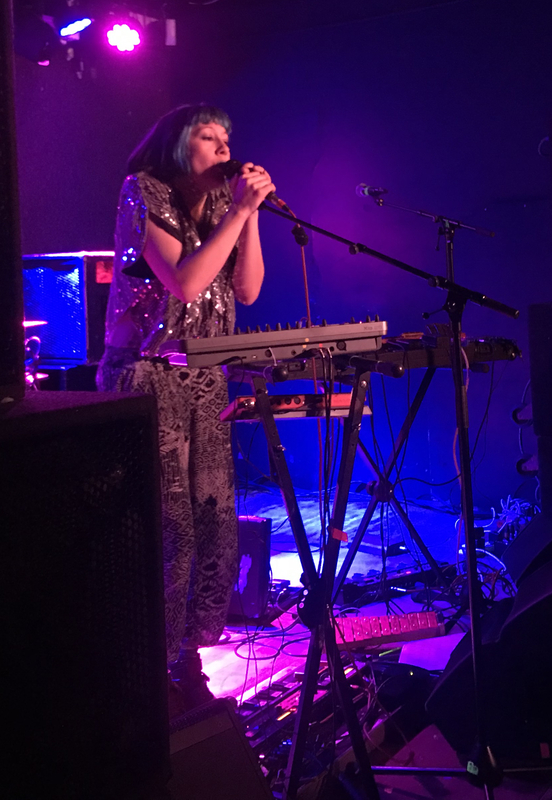 First up though was support act She, Robot – also known as Suzy Condrad – she took to the stage in a sparkly top behind a console of gubbins much like Funke does, and frankly she had me won over from the off. To start a gig just up the road from where Xylophone Man used to busk (although he actually played a glockenspeil) with the said same instrument, looping it into the mic to open the set with Whose Army, was a sure fire way to win me over. She effortlessly builds layers of sound and vocals to build an ethereal soundscape – really clever stuff, and really engaging. Seven Bells was up next, then a Ukulele makes an appearance for Walk of Shame. A sublime cover of Joy Division’s She’s Lost Control was up next, one of my favourite songs which always means a cover needs to tread carefully – no fear on that score, it was a compelling interpretation. Breakdown was next, then Fragments and finally forthcoming release Brains. There’s always that extra bit of excitement at the prospect of a new Levellers album dropping through the letterbox – unfortunately for me the postie arrived when I wasn’t in over the bank holiday weekend, so impatient I had to resort to iTunes to have a listen before picking up my goodies this morning. Reading reactions online has been a bit like those irritating Marmite adverts on TV (for the record, I definitely fall into the hate camp for Marmite) – with fans seemingly either loving it or hating it. Having not made it so far to the live tour – my postponed date in Milton Keynes has been rescheduled for when I’m at a wedding, sadly – so I’m going to have to peruse the fixtures for another suitable date to check it out. The new arrangements of familiar songs were a surprise to me, and I’d say a very pleasant surprise! Recorded in the famous Abbey Road under supervision from John Leckie, and some musical assistance from The wonderful Moulettes and Tobias May this is the familiar (mostly) rendered in a very different way. 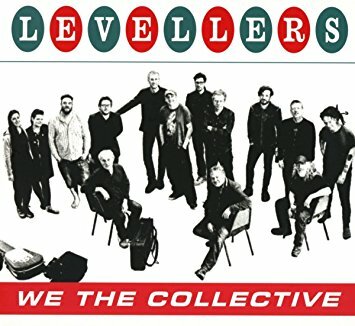 I can kind of understand people’s cognitive dissonance – the Levellers music has lived with many of us for years, a comfort blanket replete with meaning both in the merit of their own lyrics and melodies or through life events they provided a soundtrack to (or in mosh pits they’ve been danced to in). I’ll be honest, I struggled when ‘wrestled with our’ became ‘whispered all our’ fears on the 1998 re-release of One Way. I still bristle a bit when they still sing it that way now (I wonder if they did on the Levelling the Land anniversary tours? I’ll have to check on the Live CD!). Did you miss Ken and Dan on the radio? And Alex too, I suppose! 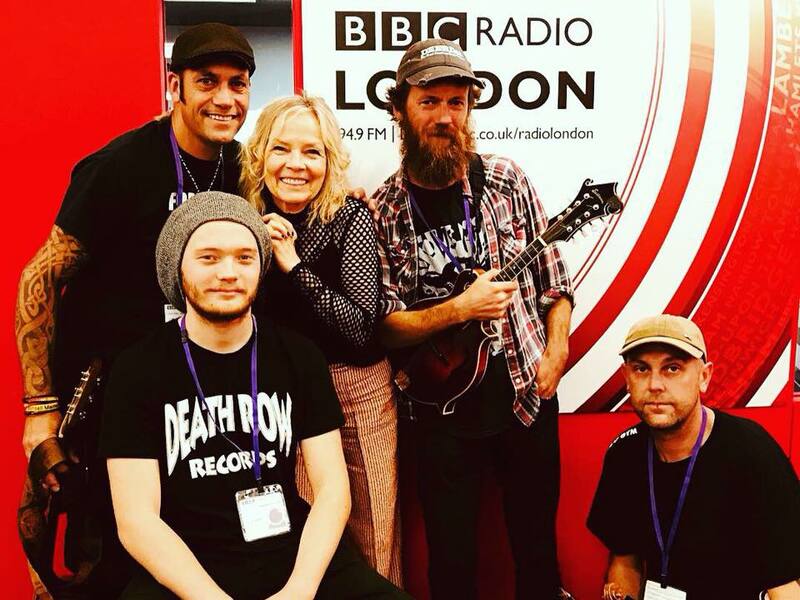 It seems highly apt that The Enemy Within tour took a diversion to the BBC – BBC Radio London, to be precise where presenter Jo Wood spent 20 minutes or so chatting with Ken, Dan and Alex and had them play a few tunes too! If you missed it, then you can catch up here. They did a really good job I thought of getting the message out there, and some quality tunes ahead of their data at the 100 Club in that London! The Pests from the West beat the Beast from the East.. In true British fashion social and mainstream media alike was awash with perhaps rather exaggerated fears regarding the weather, casting doubt on whether the Warsop leg of The Leylines tour would happen. It’s true some areas of the country really were hammered, but certainly North Nottinghamshire was okay, it put paid to a few acts making it, but some redrafting by Dave and some rearrangements meant a splendid day of music would definitely go ahead – with some hardy souls camping in the car park from the night before! For our own part, both Ella and Morgan had fairly chunky distances to come – Ella and Becki drove up to mine the night before in occasionally grim conditions, with Nick and Morgan joining us in the morning in plenty of time for a sit and chill before we convoyed up to The Black Market Venue without incident – we could’ve probably squeezed into one car but it proved to come in handy later having two. Once at the venue there was time to catch up with folk in the bar side before the main room was open. First up were Darwin’s Rejects – we got Ella and Morgan’s stuff sorted by their stage as they struck up with Phat Bollard’s Millionnaires – I must say they were sounding the most tight I’ve seen ’em, and as a fellow box banger I did have slight envy of Rob’s cymbal/tambourine stand! A Levellers section comprised Sell Out and then a Leylines style arrangement of Fifteen Years with the slow build up. Back to grassroots and Ferocious Dog’s Unconditional and Headsticks Cold Grey English Skies were up next. 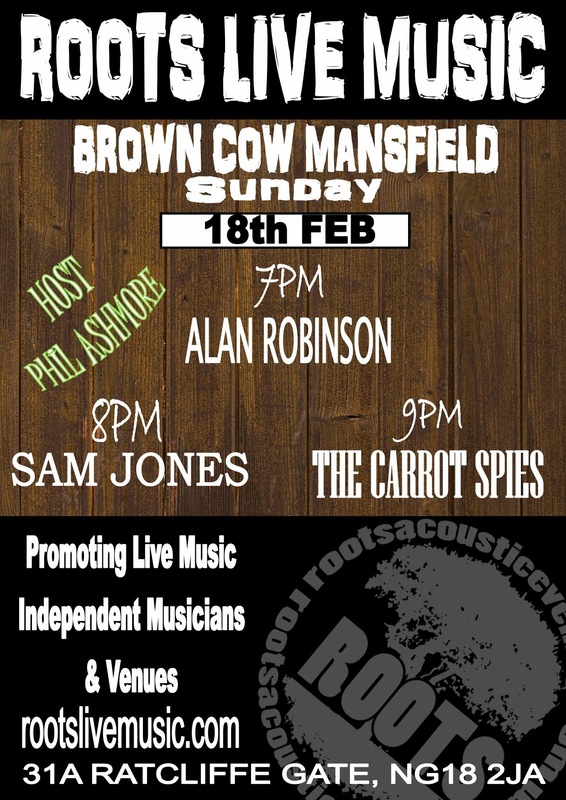 This blog post is nearly as horrendously late as I was a week ago to the Roots Acoustic Evening at the Brown Cow in Mansfield, it meant I managed to miss the host, Phil Ashmore and the first act on too, Alan Robinson – but luckily my epic day of driving got me there in time for Sam Jones. I’ve not seen Sam in solo acoustic guise in ages, and it’s always a treat (and in truth, why I feel motivated to write a blog post more than anything, especially in this venue where I first saw him!). So once I’d got myself loaded up and my gear out the car (chances are I wouldn’t have made the trek from home to Stevenage and then to Mansfield, but we were playing, you see, under the guise of The Carrot Spies since Kev couldn’t make it, sadly – and frankly we aren’t The Star Copiers without a full compliment of members – lucky we’ve got a gigantic list of anagrams isn’t it? But anyway, the amazing Sam Jones was up first – he’s such a talented fella. He was standing in for his dad, Mark, who was feeling under the weather (Sam himself complained of feeling rough too, but it didn’t bring his performance down any that I could see!). He kicked off with Death of the Free Man, then that lovely cover of Bee’s Wing he busts out for his Mum, Kathie – who was in the crowd to enjoy it, always lovely to see! I took to Facebook live for this as it’s one of Ella’s favourite songs too (I couldn’t resist getting Lucy in on the act! ).